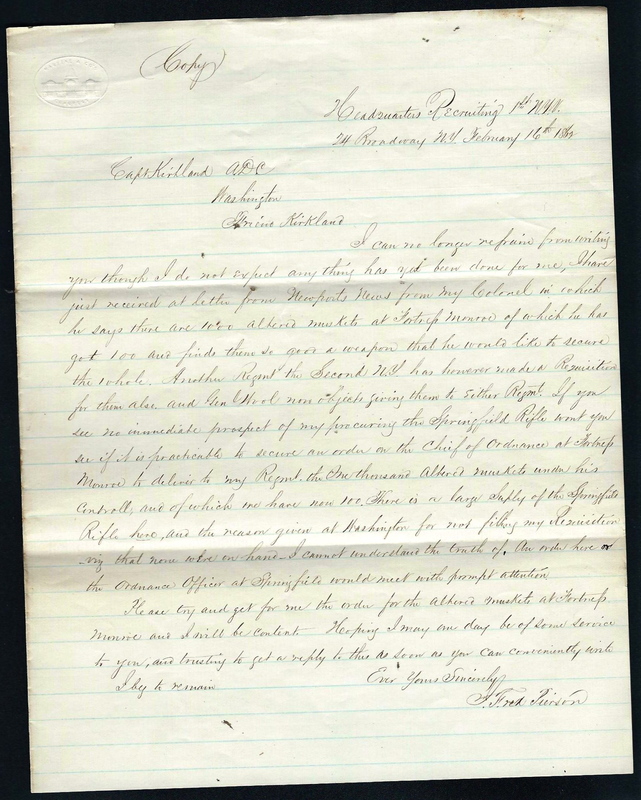 This letter centers on a single, significant problem faced by Col. John Fred Pierson of the 1st New York Infantry: “how to outfit his unit with the best arms available. The regiment had originally been issued the old smooth-bore, “old pattern” muskets that had been the military mainstay for more than a generation, but they longed for the better and more accurate rifled weapons, such as the Springfield rifles. Beginning as early as July 1861, Pierson spent months writing letters to the New York State Adjutant General to secure the newer arms for his men, and every time he thought he had received promises, or even approval, it seemed only to result in further delays. Even though his requisition had been approved by the state, Pierson was informed that the Springfields were being sent mostly to the West, since western regiments have been heretofore neglected or overlooked in the distribution of these arms. Fred Pierson was one of the first New Yorkers to answer the call to serve the Union after the emergency at Fort Sumter flared into gunfire. Resigning from the 7th NY National Guard in early April, he signed up in New York city to accept a commission as 1st Lieutenant in what would become the 1st New York Infantry, the first regiment in the state to enlist for two years’ service. I can no longer refrain from writing you though I do not expect anything has yet been done for me. I have just received a letter from Newport News from my Colonel [Colburn] in which he says there are 1,000 altered muskets at Fortress Monroe of which he has got 100 and finds them so good a weapon that he would like to secure the whole. Another regiment — the Second N.Y. — has, however, made a requisition for them also and Gen’l. Wool now objects giving them to either regiment. If you see no immediate prospect of my procuring the Springfield Rifle, won;t you see if it is practicable to secure an order on the Chief of Ordnance at Fortress Monroe to deliver to my regiment the one thousand altered muskets under his control, and of which we have now 100. There is a large supply of the Springfield Rifle here, and the reason given at Washington for not filling my requisition — viz; that none were on hand — I cannot understand the truth of. An order here or the Ordnance Officer at Springfield would meet with prompt attention. Col. Kingsbury has been directed to send Springfield Rifles to that regiment. — A. V. Colburn, A.A.G.